Respondents answer a series of pricing questions to determine the highest price they are willing to pay. Warning: Sawtooth Software considers Choice-Based Conjoint and Adaptive Choice-Based Conjoint as the preferred techniques for measuring price sensitivity. Please use the Price Laddering approach with caution. 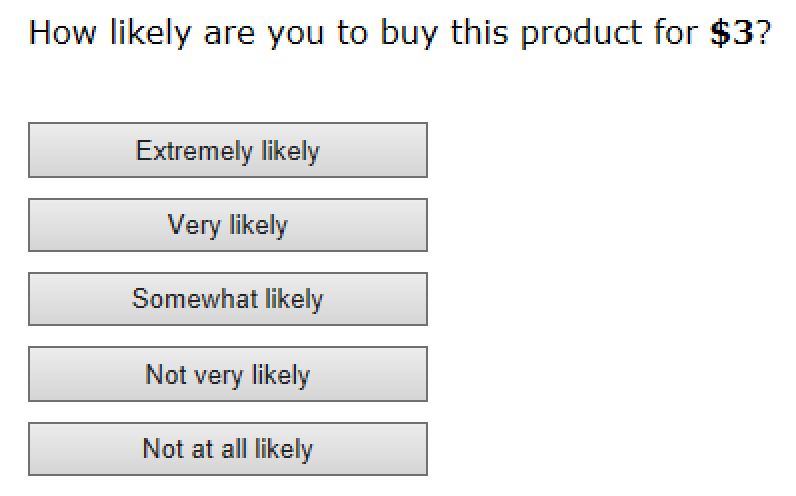 Respondents answer a series of pricing questions. The question completes once the highest price the respondent is willing to pay has been determined. Header 1 has two possible question texts, the former for a five-point Price Laddering question and the latter for a yes-no Price Laddering question. Line 31 of the HTML defines the prices to be offered to respondents, from least to greatest. var startPosition = 4 - Respondents start on the fourth lowest price. var startPosition = 'middle' - Respondents start on the middlemost price. var startPosition = 'random' - Respondents start on a random price. The acceptable and unacceptable response options are defined on lines 34 and 35 of the HTML. It is standard to either include two acceptable responses and three unacceptable responses (default), or one acceptable response and one unacceptable response ("Yes" and "No"). The response to be recorded if a respondent marks all prices unacceptable is defined on line 36.